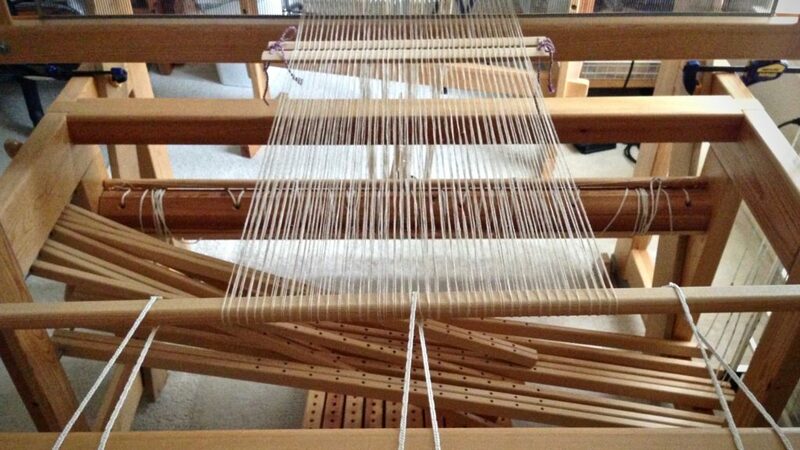 What is the first thing I do when I have a new warp to put on the loom? Insert lease sticks. When I wind a warp on my warping reel, the ends follow an alternating over/under pattern between two pegs. This forms an “X” in the wound warp, and keeps the warp ends in sequential order. This “X” is called the lease cross, and I use lease sticks to secure it before proceeding. Hence, the lease sticks take first priority as I begin to dress the loom. Essentially, they hold the warp together. New linen warp. 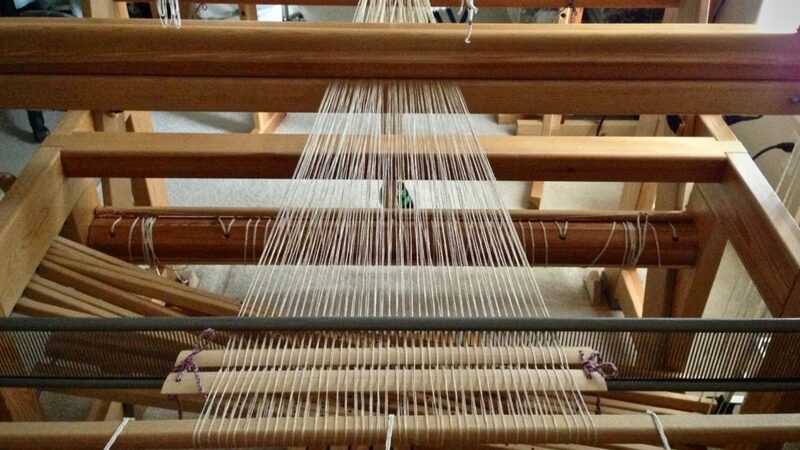 As viewed from the front of the loom, two long sticks support the reed and lease sticks for pre-sleying the reed. The lease sticks are in front of the reed. 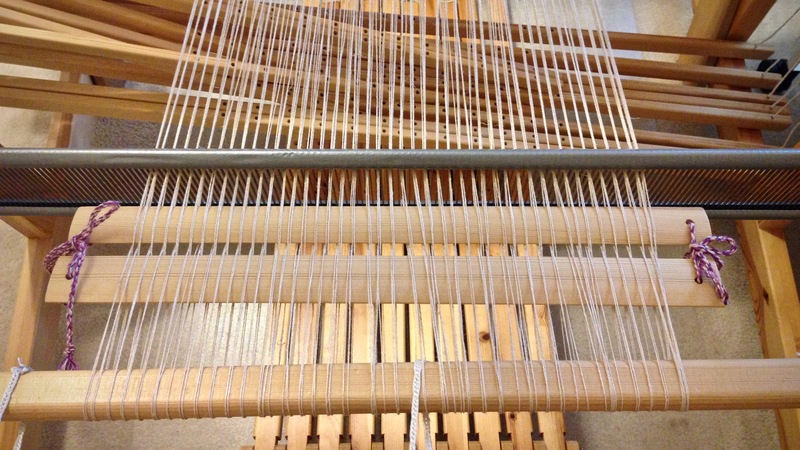 As viewed from the back of the loom, the warp is under tension (from the warping trapeze). Lease sticks have been moved to position behind the beater. 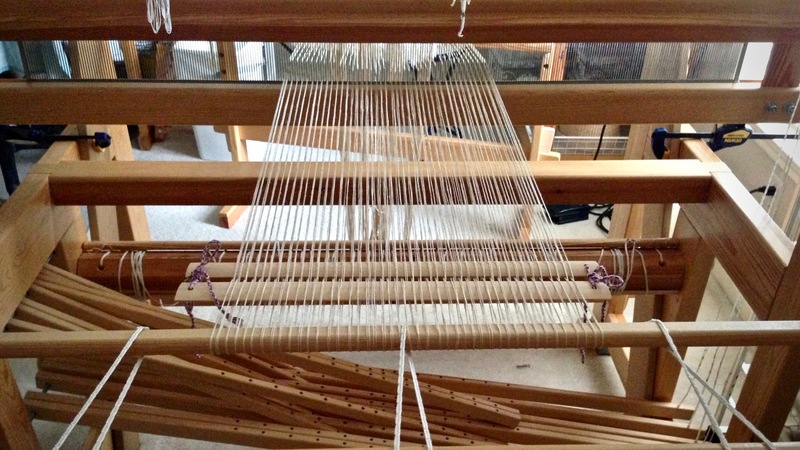 Warp ends are straightened and evened out behind the lease sticks. Reed is placed in the beater and centered. Lease sticks are moved forward, to just behind the beater. Ready to begin beaming the warp! This Christmas, remember to keep Jesus first. Jesus, the humble king, was born to die on a cross that we may live. In Him all things hold together. Joy to the world! May your threads stay in order. Thank you, Beth, and a Merry Christmas to you! This is interesting to me as I warp from the rear and the lease sticks are in the back behind the heddles. I’m learning wonderful things from your blog. Thank you. Happy Christmas to you. Happy Christmas to you, Cate! I warp back to front, and my lease sticks are behind the heddles, too. It’s not easy to tell, but I was standing behind the back beam to take these pictures (except the first one). To see more detail of the process I follow, see this link: Quiet Friday: Warping Back to Front with Confidence. You have certainly brought a smile to my face today! I’m honored that you enjoyed that little Lucia piece so much. A lovely looking warp Karen. Now looking toward the end result and I hope you do post a pic of the finished piece. Thank you for the Christmas wishes and may I return the wishes and hope that you keep safe and have a wonderful time with friends and family. Hello Alison, Thank you for your very kind sentiments! Weaving is on hold at my house until after Christmas. 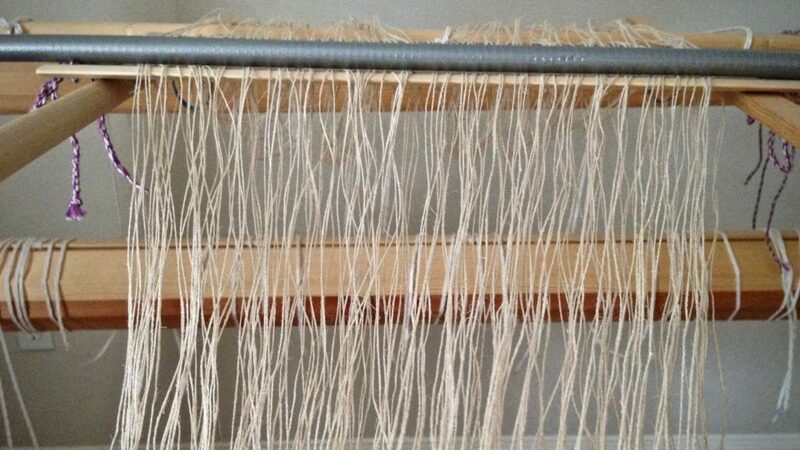 But when I get back to the loom I will be happy to show my progress and the final result of this linen project. Merry Christmas to you and your family and friends, too!